The days are long, but the weeks are short. This popular saying completely summarizes my life this semester. On Monday morning I wonder if I will ever make it through the day, and before I know it …. it is Sunday morning and I am preparing for another week of the same. My mother warned me that the older I become, the faster time flies and she wasn’t kidding. I continue to try to find at least some portion of each day to “live in the present” and not miss the hidden blessings. I continue to try to do at least one thing just for me because I want to – not because I have to or because someone else expects me to. It is a slow process to retrain your brain to live differently – but I will continue to persevere. The weather this week has been absolutely gorgeous! While we often experience two or three consecutive days of nice weather every once in a while, Kansas is known for its excessive heat, bitter cold, and torrential rains. This week has been sunny, high in the 70s, with light breezes that provide that perfect fall nip in the air. Yesterday we took advantage of the fallish temperatures and went to the pumpkin patch – a former annual activity that we have not done in the past five years. “Ron and Hermione” joined us and had a good time selecting a pair pumpkins for painting. Today Geoff and I may try to visit an apple orchard about an hour away and take advantage of a few more photo ops while the natural elements are cooperating. The changing of the leaves has only just begun here – so this may require more than one excursion. On the teaching front, classes continue to progress on or close to schedule. The 9th graders have just started Fahrenheit 451 and I am looking forward (hopefully) to some great class discussions. I had them research various topics as a pre-read activity so they are aware of the available technology in the early 1950s. Some are fascinated at Ray Bradbury’s ability to imagine the futuristic world with such amazing accuracy. This class is also finishing a Fictional Memory assignment (they brainstormed memories from ages 1-4; 5-10; 11-15 – and then selected one in which to write a fictional narrative). The final drafts are due on Wednesday and we will begin a read-around session where all stories are read aloud and constructive criticism is shared. I very much look forward to reading these imaginative essays – I dread grading them. It is so difficult to try to quantify a rather subjective assignment. The 7th grade class is reading Tuck Everlasting and starting to work on their fractured fairy tales. They selected a topic on Friday and will be outlining the story next week. The most clever idea I heard this year is a retelling of Rapunzel where Rapunzel is a prince with a long beard being rescued by a princess. Should be fun! 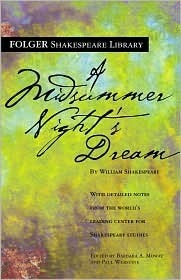 The 8th grade grammar class has just taken their first major exam (fairly decent results) and started reading and interpreting Act I scene i of A Midsummer Night’s Dream. Out of the 18 students in the class, I would say half are really excited about this unit. They come to class with their books asking if we will have a chance to do Shakespeare. I am hoping that their enthusiasm begins to rub off on those are less excited about the Bard. Tomorrow each group (there are a total of three) will perform their interpretation of this scene and then we will give constructive criticism. I am looking forward to that. The creative writing class continues to develop story ideas. These students are a lot of fun, but I do worry if some will be able to focus long enough to actually complete the 12-chapter novel. I decided to implement a system of rewards. If we complete the necessary worksheets between now and October 21, then I will take them on a field trip to the mall where we can do some character studies: people watch and take notes; listen to conversations to help form character dialog; create story ideas from various “characters” we notice. So far this has worked well. English Composition continues to be the most challenging class for me – and the most fun. The students have just finished their persuasive essay and we are in the midst of group edits. The topics chosen have been rather controversial (which I tried to ensure) and has yielded some lively conversation. Students are learning that all facts and no emotion can make for a rather dull paper — but all passion and no statistics raises questions in the mind of the reader. I think (hope) this has been a good unit of study for all. As you can see, these classes, with two sessions of English 1 and two sessions of Grammar, definitely keep me busy Sunday – Friday. I continue to add more interests to my life and struggle to find the time to focus on any of them. This weekend I took the time to focus on photography – if just for a few minutes. I am hoping that I can find some time here and there throughout the week to capture the changing leaves and reflect on the similarities of my own changing season of life. I have read with interest – and jealousy – the writing plans of J. Kaye, Vivienne, and Amanda as they prepare for NaNoWriMo in November. I think the first time I “read” of this event was last year when Belle participated, and I was incredulous that anyone could possible write a novel in 30 days! Since that time I have read numerous books on writing, including No Plot, No Problem, and I have daydreamed of joining the thousands of online participants. While I truly do not think that this is the right time in life for me to do this (all that grading you know…..) I have taken the step to at least register my name on the site and join the regional group. Did you know that there are currently over 800 people in the greater Kansas City area registered?! That is insane – and wonderfully comforting to know that so many other aspiring writers are in such close proximity. What pushed me over the edge to actually sign up was the writing inspiration I received on Friday. For months now I have had these two story ideas: one idea is a book, similar to the Christmas Cookie Club, where a group of female friends have gathered together for a Stitch Group. The book would be a reunion meeting – since the group itself dissolved several years prior. Each chapter of the book would focus on one of the members’ lives – and how much has changed, as well as stayed the same, in that intervening time period. While this is loosely based on true events in my life – the story itself would be primarily fiction. The other story idea is one that focuses on the sandwich generation — those women who are still raising their own children and yet are now responsible for taking care of their aging parents. I don’t think this has been discussed much in literature, but it is a real-life situation that will become more and more prevalent as the baby-boomers enter the geriatric stage of life. Again, this is a subject that rings close to home, but I have some ideas that fictionalize the characters and events, but keep the truth of the subject in tact. On Friday I realized that these two ideas can (possibly) be married into one story. The over-arching story is the one of the sandwich generation – and in her search to find herself in the midst of all the care giving she decides to organize a reunion of the Stitch Group – that same group of friends who were so supportive and necessary to her life when she was a young mother. In this process she discovers women need that female fellowship – but that we can never return to the past, we must always move on towards the future. Anyway, that is the idea in a nutshell and I have grand hopes of trying to write it one day. Perhaps that day will begin on November 1, 2010 — or perhaps it will begin much later in life. I continue to wallow in a reading slump. I flit and float from book to book, never finishing more than a chapter. I don’t know what is wrong with me! I love the RIP challenge and have looked forward to it since last November – and yet I have not finished a single book. I have started reading The Happiness Project, but only manage a few pages a night before I turn out the light. I have skimmed through several books on writing and journaling, but I am now finding that much of the information I have already read, it is just time to put into practice. So that leaves me in a dilemma: Do I sign up for the Read-athon or not? I absolutely LOVE the read-athon and have participated in three previous ones. I even scheduled my classes so that I would not have mandatory papers to grade that weekend and I could devote quite a bit of time to reading (and cheering and blogging). On the one hand I think perhaps the read-athon would help me get out of this funk. There is something contagious about being a part of a “competitive” group activity, and perhaps that social element would help me to overcome my general malaise. On the other hand, I do not need another unfinished project in my life — that would be too depressing. I suppose I will wait a few more days to make that decision. If I decide to participate, then I will definitely use the time to read some wonderfully horrific and thrilling novels for Carl’s challenge. That should put me in a great Halloween mood! How about you? Do you plan to participate in the read-athon this weekend? If so, please feel free to share what books you plan to read – what snacks you plan to serve – and what strategies you plan to follow. Well, I did not intend this post to be a novella. I hope that the bold-faced sections allowed you to skip the uninteresting parts and that the length did not scare you away. As busy as you are, I can see why you're in a reading slump. My mother told me the same thing about time and boy, were our moms right – time sure is flying by these days! I think it's a great plan to try and write even though you have such a full schedule! Also, it must be a lot of fun teaching a Midsummer Night's Dream to 8th graders. Best wishes for NaNoWriMo–I hope it's exciting and fun for you! I'd do it, but I plan to complete my WIP that month; I have something like 58,000 words written, and I still need to write from the black moment to the end. Hoping to be accepted to attend a SCBWI writing retreat first weekend in November and work with Nancy Mercado of Roaring Brook. BTW, your book ideas sound wonderful. Your original story about the heroine in France sounds excellent also, but trickier to pull off. Even so, it would be very in keeping with teens' current interest in time travel, magic and so on. Work on whichever idea has the most emotional/ spiritual juice for you. "The days are long, but the weeks are short." Isn't that the truth?! Sounds like your days are amazingly full, yet it's wonderful that you take time and do something just for you. I still haven't decided about the readathon. Daughter #1 will be home for fall break… maybe she would join me. We'll see. I am having exactly the same experience with my teaching week, Molly. I don't know where the weekend goes – suddenly it is sudden and I have all this reading/grading/lesson-planning to do. Sigh. But the teaching exercise you describe here sound *amazing*. Molly, if my life was a busy as yours, I am sure I would not be able to focus on reading. I would be thinking about all the other things that I needed to do. Taking time for you is important and it does not need to be reading–enjoy some time for you guilt free. I'm not doing the read-a-thon this year because working full time now, I can't afford to give a whole weekend to reading. I'm okay with that as I get at least a few hours of reading on weekdays and more on weekends. It is exactly because of my crazy schedule that I am feeling bad about my reading…and it sounds like this is your issue as well! 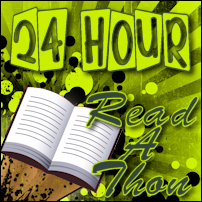 I am thinking that if I at least read for six or eight hours for the read-a-thon, it will be better than nothing. And I will pick quick books to make myself feel productive! Your daughter and her friend are so darned cute together. I am planning to join in on the read-a-thon, but I have absolutely no plans regarding what to read or eat yet. How I wish I could be a student in one of your classes. I know I would enjoy all of them. I'd say 9 out out of 18 is doing pretty good for Shakespeare at this level. You are a good teacher and that's what it takes to enjoy our first experiences with Shakespeare. After you long, hot summer I am glad you were able to enjoy a bit of the beautiful fall weather picking apples. We do a trip down to Nebraska City for apples every fall but we've also given up on the trip to the pumpkin patch. I think some of that is that I like to get a lot of pumpkins now and it's so much cheaper at the grocery store! I've thought about doing the writing gig in November but I'm hoping to make a lot of Christmas presents this year and catch up on reading so I suppose I should add one more thing. But I am definitely doing the readathon. I never get as much read as some people, and not even as much read as I would like to but I do love being part of it. Sounds like your classes are going great! I love the idea of a people observing field trip as a reward! How do you get everything done Molly?? Just reading all of that made me tired …you must be Wonder Woman. Your classes sound so interesting and wonderful!!! I'm reading again this year during the RAT. The past few times I've cheered too but I'm not going to this year..just sit back, relax, and enjoy!! Hope you get a chance to join in on Saturday! I always enjoy hearing about what you are doing with your classes. I think you do a great job and really challenge them while also making it fun. It sounds like you barely have time to breathe … but perhaps taking some time for the readathon is just what you need. To avoid the feeling of "another unfinished project", I do a Readathon Lite. I read as much as I can and as long as I can and then…I…go…to…sleep. I love the idea for your novel, Molly! I'm a fellow "sandwicher," and I think you're right that it hasn't been overly mined for fiction material yet. And I think the Readathon really might jostle you out of that reading slump – I hope you decide to join in! You are one busy lady–and bursting with ideas! Completely understand your reading "slump" but perhaps the Readathon lite idea will help (I've never done one, so I'm not too clear on how they work). Kudos to you for at least putting your name out for NaNoWriMo. It is a step toward your ultimate goal. I think your combined story idea sounds fantastic! I won't be reading in the readathon, but I will be hosting a mini-challenge. No read-a-thon for me. I'm getting back into read-alongs. That helped me with my reading slump last year. Awesome news about NaNoWriMo. I probably won't this year. Too much insanity with the kids and life. I'm staying on the path of a little every day though. I sort of veered off the road for a few weeks, but I'm back and this time, I have a map…lol. Molly, I am beginning to feel like we are ships that pass in the night. I don't blog weekends and you are not around much during the week.Blogging is hard, isn't it. Ron and Hermione are such dolls–and enjoy the weather. We've been having much of the same and are loving it! My brother is currently reading Everlasting Tuck right now for his school–one I never read. Love the idea of the inverted Rupunzel! And yes, love the idea of your married storylines. Good luck with NaNo. I'm just catching up on your Sunday Salon post and saw the good news about you joing NaNoWriMo. Good for you! I like your story idea too. I think this is just the push you need to get started. Good luck. I'm not sure about NaNoWriMo this year, either. I'm currently working on a WIP right now, plus I still have one going into second draft. If you do Nano, I'll be rooting for you! I wish I could go back to school and have you as a teacher!